A slow cooker, enough ginger ale to cover the cornbeef plus honey on top of beef. Cook for 8 hours on low and then rest it for a bit. Served up for family with a side dish, left overs if any for sandwiches or fritters next day. do like the low salt version. I do prefer the low salt version but Beef Corned Silverside is a lovely reasonably priced meal. Just put silverside in large pot and add gingerbeer to cover and cook. So delicious and no need for the brown sugar, cloves and all that stuff. This is a great meat cut! It is so versatile and we enjoy it as a roast, fritters, sandwiches how ever you do it you wont be disappointed! I used to do it in a slow cooker but it always came out a bit tough. Now I cook it for just as long but on a slightly higher heat than the slow cooker in a pot on the stove and it almost falls apart.. which is awesome for the kids as they don’t yet eat tough meats. A few bay leaves, cloves and an onion gives it the best flavour. Always great quality meat. 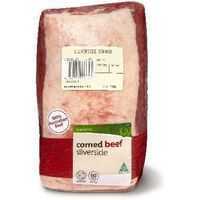 How would you rate Beef Corned Silverside Small?